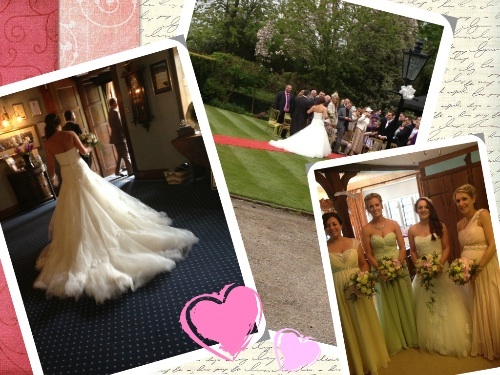 It was clear from the moment we settled down to start the bridesmaid’s hair that this was no ordinary wedding. In what feels like 5 years of winter the clouds parted and the sun just peaked through over the magical grounds of Boys Hall. I am what some may call ‘a regular’ at this venue and the buzz starts as soon as I reach the grand gates at the entrance, slowly make my way up the drive and step foot into the quaint manor. The lucky Bride was Becky and she was marrying her ‘one’ Paul Thompson. The date was 17th May 2013 and the venue was Boys Hall in Ashford, Kent. 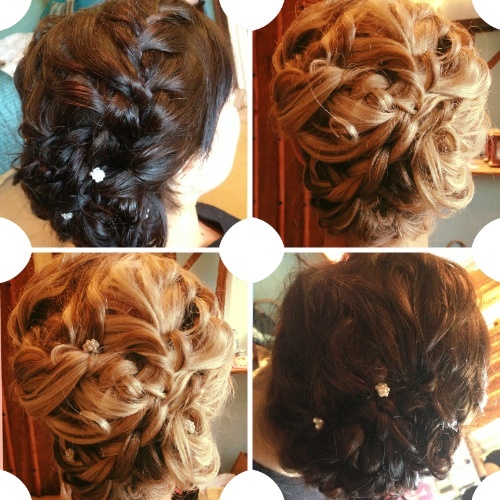 It was clear from the moment we settled down to start the bridesmaid’s hair that this was no ordinary wedding. The buzz of calm mixed with a girly excitement kept us giggling throughout. The three bridesmaids were perfect maids to Becky, not only being on top of everything but also keeping a relaxed pre-wedding ceremony energy. Over the few hours I was there the more it felt like the morning after a girly sleepover as the laughter and fun became natural and we were reduced to giggling fits more than once! My domain the hair was a classic loose knotted low bun, sections of hair were interweaved with plaits and twists creating a romantic feel with a touch of glam added by the sparkle pins randomly placed. Becky’s hair was pulled to one side, interlaced with curls and loose strands framing her face, a delicate fishtail plait was intertwined in the hair adding a dynamic layer of detail. The tiara was a mix of delicate flowers and heavier crystallised flowers offset to the side. The morning flew past and we could hear the natter of guest arriving. The band (The Redfords) started to play, greeting the family and friends and we were able to look down over the lawn and feed off of the excitement that was building. An official knock on the door brought seriousness to the proceedings as the registrar came in to ask the pre-wedding questions. I always feel so lucky being a ‘fly on the wall’ for this moment and hearing the answers the brides give always make me smile and intensifies the romance just a little more! Becky and her bridesmaids made their way to the foyer, the awaiting groom seemed so far away across the strong green grass. The Redfords started to play Heaven (DJ Sammy candle light mix) and the bridesmaids led the procession. I was close enough to see the guest smiles, tears and gasps and combined with the goosebumps the music gave I was well and truly romanced out! Before the ceremony was over I was able to get some pictures of the finishing touches. The attention to detail was simply stunning, from the cute record table names, the opulent table plan and the soft pink card detailing. 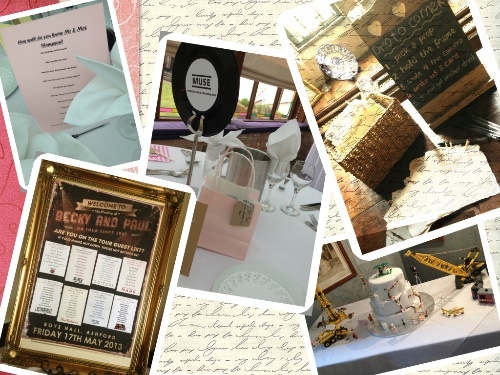 A novel idea was the photo corner set up, which included a vintage picture frame and cards to write a message to the happy couple. The cake also threw in a fun element to the proceedings with the quirky Lego construction tying in the common interest between the pair. The day went without a hitch and Becky was the model bride. Calm, collected and completely in love and this made everyone else feel calm and allowed them to totally enjoy the day. Its no secret that wedding can be stressful and that stress can manifest as a knot inside the bride and stay with them throughout the day. It’s so important that all is done to minimise and calm this before the big day…take the time to relax, take stock and breathe. Switch that stress to excitement and don’t sweat the small stuff.